Until now, we have entered only one input file into Ariane. Use Ariane’s sequential mode to enter multiple files. Note: number must contain a constant digit number and its value must increase by one in chronological order. 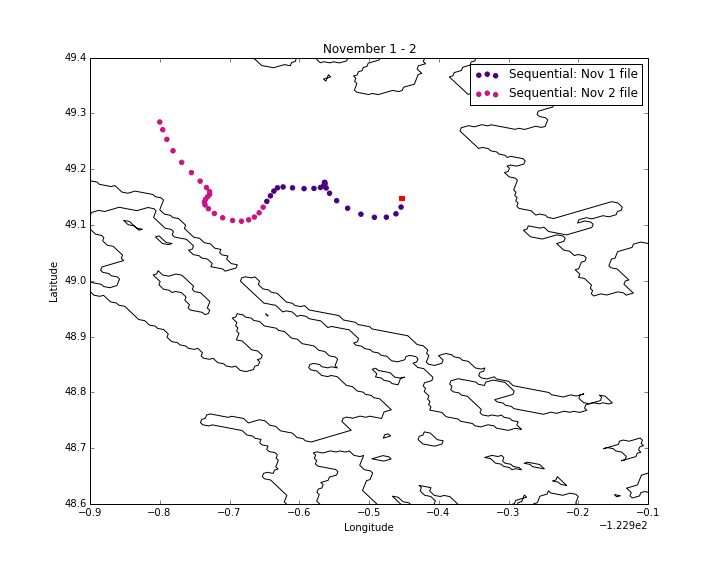 For example, file SalishSea_01_grid_T.nc contains tracers for November 1st and SalishSea_02_grid_T.nc contains tracers for November 2nd. First, let’s take a closer look at the parameters in the namelist sections. The parameter names are c_dir_X, c_prefix_X, ind0_X, indn_X, maxsize_X, and c_suffix_X where X is zo, me, te, sa for the ZONALCRT, MERIDCRT, TEMPERAT, and SALINITY sections, respectively. c_dir_X is the directory with the symbolic links for the input files, the namelist, and the initial positions text file. Previously, we have been entering the full filename, SalishSea_t_yyyymmdd_yyyymmdd_grid_T.nc, into c_prefix_X. Now that we have formatted the filenames as prefix_number_suffix, c_prefix_me takes on the value of the prefix and c_suffix_me takes the value of suffix. ind0_X is the number for the earliest input file and indn_X is the latest. maxsize_X is the number of digits in number. Under the ARIANE section in namelist, change key_sequential to TRUE. Add a SEQUENTIAL section in namelist. This section has one parameter, maxcycles. We recommend the value of this parameter to be 1 since this tells Ariane to stop generating trajectory points once it has run out of input data.